AUBURN, Ala. – Auburn University joins 10 other colleges and universities across the U.S. this fall in the 16th cohort of the American Council on Education’s Internationalization Laboratory. A campus-wide Committee for Strategic Internationalization with representation from every college and from service units across the university will lead a comprehensive effort to develop strategies and goals for Auburn’s internationalization efforts over the next 20 months with the goal of producing long-lasting institutional change. The Committee for Strategic Internationalization is co-chaired by Chris Roberts, dean of Samuel Ginn College of Engineering; Martin O’Neill, department head of Nutrition-Dietetics and Hospitality; Valentina Hartarska, alumni professor of Agricultural Economics and Rural Sociology; Andrew Gillespie, assistant provost for international programs; and Jenn Mason, director of international initiatives. Along with their counterparts from other cohort universities, the co-chairs participated in the opening meeting of the lab in Washington, D.C. on Aug. 24. Auburn joins the 138 universities who have participated in the lab since 2002. The committee will work with a designated ACE lab advisor who will visit campus, conduct monthly check-ins and provide guidance and context throughout the lab process. Auburn’s committee co-chairs will travel to Washington, D.C. to meet with ACE representatives and other members of the cohort several times throughout the process. 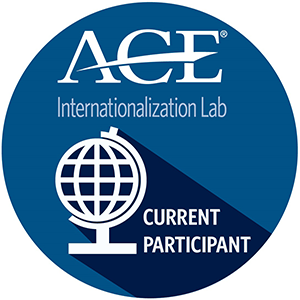 Auburn’s first ACE Internationalization Laboratory report can be found on the Office of International Programs’ website here, along with more information on the internationalization initiative.